Last week more than 250 people from several agencies spent a day playing make-believe in Seattle’s new State Route 99 tunnel – for a very grown-up purpose. We conducted a full-scale emergency exercise, staging a multi-vehicle crash that led to a vehicle fire, multiple injuries and evacuation of the tunnel. First responders help “patients” out of the SR 99 tunnel last week as part of a full-scale exercise to test systems and give emergency crews first-hand experience in the tunnel. To make it as realistic as possible, crews brought in vehicles – including some turned on their sides – and also found volunteers to play injured drivers. A moulage makeup artist added cuts, gashes and fake blood to our volunteers and each “patient” received instructions about which symptoms to share with first-responders. (A few were even told to be combative or confused and to not follow orders – just as disoriented, injured people do in real life). King County Metro Transit also brought a bus full of employees to practice emergency evacuations. A moulage makeup artist created realistic injuries for the tunnel exercise, to simulate what fire and police crews would see when responding to a real emergency. A volunteer “patient” calls for help on an emergency phone as the SR 99 tunnel fills with smoke from a simulated vehicle fire during last week’s full-scale exercise. Emergency exits and phones are located every 650 feet in the tunnel. We didn’t set a real fire in the tunnel, but fire crews used smoke canisters and flashing lights to simulate a fire and how smoke can disorient people trying to leave an area. This allowed us to test our ventilation system as well as the deluge fire suppression system – think an office sprinkler system on steroids that can be controlled section by section and pumps 17 inches of water per hour. Media and responders watch as water from deluge system obscures the rest of the SR 99 tunnel during last week’s full-scale emergency exercise. Once everything was in place, Seattle police and fire crews responded just as they would to 911 calls and alerts from the tunnel’s monitoring systems. They staged vehicles and then began evaluating and treating patients – including practicing extracation from junked vehicles. Working with police, they also helped evacuate the patients out of the tunnel. Meanwhile, WSDOT crews operated the tunnel’s numerous smart systems from our Transportation Management Center in Shoreline and other crews responded to help with traffic control, working closely with Seattle Department of Transportation officials. The “patients” were pretending to be hurt for the SR 99 tunnel exercise, but first responders treated it like the real thing. All agencies train regularly, but a full-scale exercise is a much more extensive undertaking. We worked with the federal Transportation Security Administration – and all the partner agencies – for nearly two years to pull the event together. We believed it was worth the effort because the new tunnel will change both how travelers move through the city and emergency response inside. And, of course, there’s nothing like working in the actual tunnel to see how everything works compared to reading maps or even taking a tour. 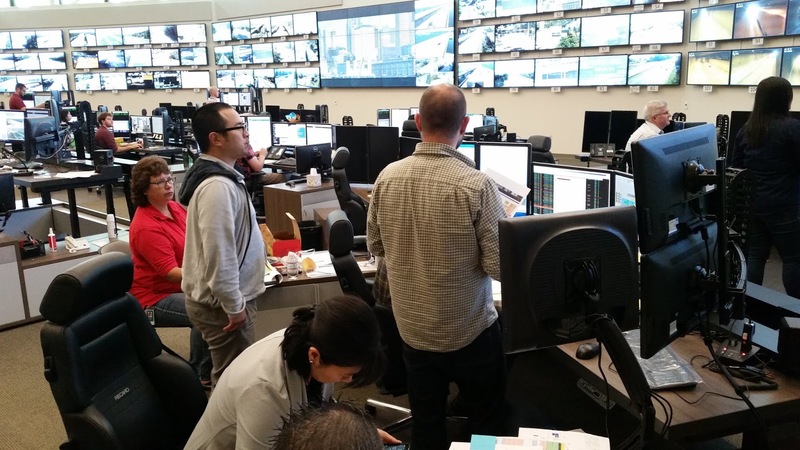 Staff kept track of the SR 99 tunnel full-scale exercise via monitors at the North Operations Building, top, as well as the Transportation Management Center in Shoreline, below, where the tunnel emergency systems are tracked and activated. Final evaluations are still being completed and will be included in an After Action Report that highlights what went well and areas for improvement. We know, for example, that we need to continue training on radio systems so that everyone can communicate with each other within the tunnel. The exercise also identified that different agencies use different phrases for driving against regular traffic flow – contra flow or wrong way travel – so we’ll work on developing common terms. The exercise was successful in that we were able to test all the systems and scenarios we set out to do. In a greater sense, though, the real accomplishment was the chance to design, train and execute the drill with all the partner agencies contributing their skills and expertise. Every emergency is different and has its own challenges, but last week’s day of make-believe – and all the work before and after the exercise – left first responders better prepared for whatever they will face in the tunnel and elsewhere. That’s the ultimate goal of any exercise like this and we’re thankful for everyone who participated. How did we ever get along without these gazillion-dollar systems and personnel? With the viaduct, all we could do is get on it and go. IKR!?! Safety and infrastructure advancements are so over-rated! What ever happened to the partial "blowout" of the tunnel wall and repair? Seattle Tunnel Partners, the contractor on the SR 99 Tunnel Project, repaired the non-structural damage to the building and engineered a fix. The test was performed again with success. When will the construction in Tacoma end?